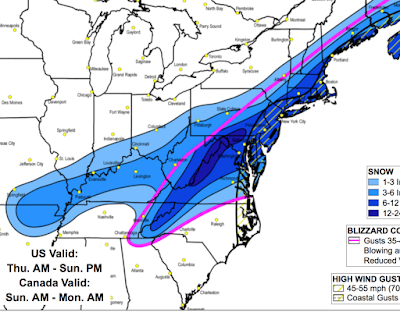 MSE Creative Consulting Blog: How Well Did Weather Science Forecast the Blizzard? 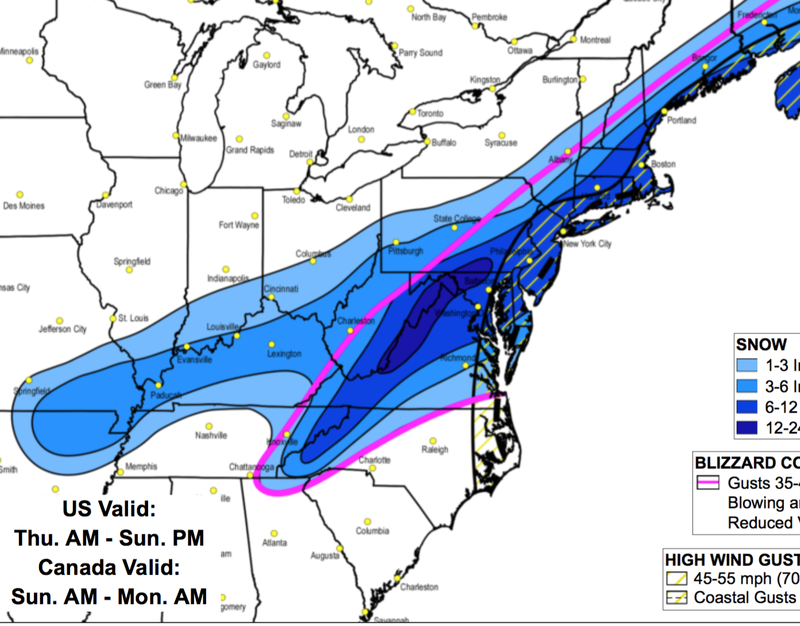 How Well Did Weather Science Forecast the Blizzard? The forecast of the huge blizzard in the East was another triumph for AccuWeather and for weather science in general. Five days in advance we were forecasting one to two feet in the areas that ultimately were hardest hit! The area within the pink line was forecast to have "blizzard conditions" -- another excellent forecast of extreme conditions well in advance. Here is a map of the amounts of snow that actually fell. As you view this, please keep in mind the shape of the two maps (map projection) is not exactly the same. Note there are two bands of heaviest snow, one along the Ohio River and one along the east side of the Appalachian Mountains. The forecast got that nearly perfectly correct -- five days out. Of course, we were not yet forecasting three feet as that would have been a nearly impossible forecast that in advance. Forecasts of this nature allow our clients such as transportation companies, electric utilities, emergency managers, etc., to make plans to deal with the storm far in advance. Other forecasts of this storm were quite good. Combined with the huge forecasting success of the vicious Christmas week storm, one would think people would be praising meteorologists and newspaper editorials would be written as to the value of weather science -- lives and dollars saved and uncounted billions (yes, billions) of hours of inconvenience mitigated. 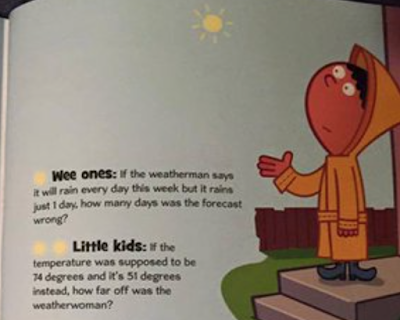 So, it came as quite an unpleasant surprise yesterday evening when it came to my attention there is a children's book ("Bedtime Math" to which I am intentionally not linking) that teaches young children that meteorologists are buffoons. Below are samples of the pages in question (h/t Dr. Harold Brooks). Parents, obviously this is nonsense but I'd like to make a bigger point. 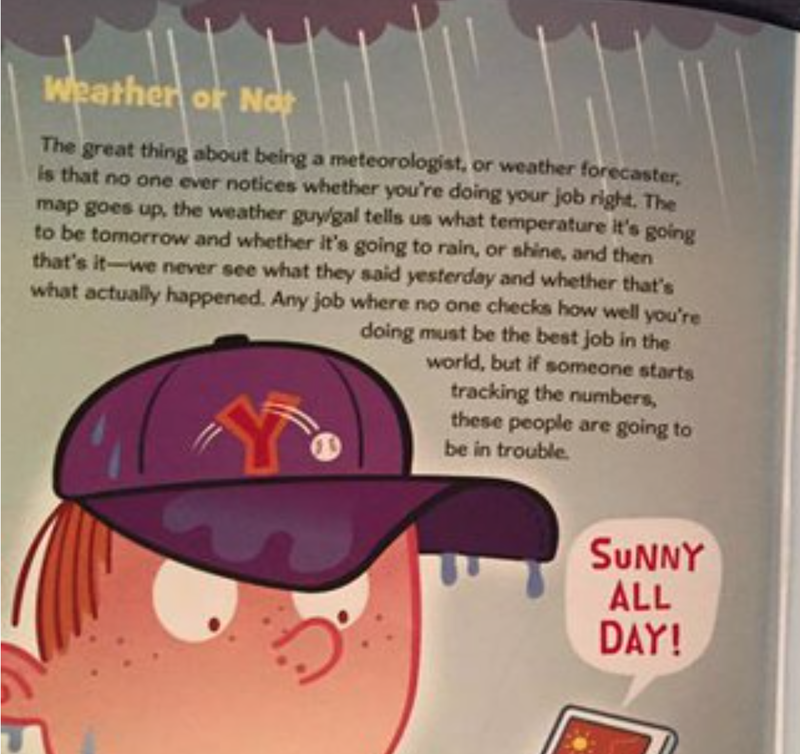 Children in the 2010's need to be taught that forecasts of extreme weather are important and should be taken seriously as they grow up. Social science research demonstrates that teenagers are at elevated risk of being killed and injured in extreme weather. A better appreciation of the value and reliability of warnings of storms might just help prevent future family tragedies.